The Bear and the Tiger was one family. The Eagle and the Monkey (or some say the Snake) was another family. Once they had all been intermarried but at one point in history they split and lived in two villages: Mong and Luo. One of the only images known to exist of the undefeatable Li Shu Wen. This little fable refers to an unsual marriage of two great styles, BaJi or the Eight Extremes Boxing, and Pi Gua or the Split-and-Suspend Palm.These styles, so different looking, were actually taught together because they were perfect compliments for each other. At one point in their history they were split apart with major representatives in the two villages mentioned above. At the middle of the 19th century a child, Li Shu Wen (1864?1943), was born destined to restore these styles – each based on a pair of animals – to the complimentary union they had once been. Li learned first from Jian Dian Sheng (b. 1785) of Mong Village. Then he traveled to Luo Village and studied with Huang Si Hai there. Li was more than just a student. His martial arts were of the highest caliber.�Although his stature was small, and his appearance unimpressive, his skill was marvelous, exceedingly brave, furthermore his great authority meant that when crossing hands he was never beaten.�His spear technique became so potent he was known as the “God of the Spear.” Born in Zhang Sha Village he was a native of the famous Cang County, the homeland of some of the best Kung Fu in all of China geographically AND historically. Though displaying light and controlled performance he was surprisingly gifted with incredible power it was said that he almost never had to strike an opponent twice. He attracted many students who were already formidable martial artists. Grandmaster Li Shu Wen’s last indoor student, Liu Yun Jiao. Li Shu Wen was not a “nice person.” He took on challenges his whole life often boasting to the challenger the movement that would end his life. Even Li’s final days was a matter of dispute. Li was challenged to a fight with spears by a much younger man. Though over seventy Li took on the challenge and dispatched his opponent. Furious the fallen boxer’s family conspired and had Li poisoned. This was the end of the famous fighter. On the other hand Li was known for impassioned dedication to his art. Every chance he got he practiced his favorite weapon, the Great Spear. His lineage to this day still retains the unusual practice of this weapon? Grandstudent Tony Yang demonstrates a move from BaJi Quan, Li Shu Wen’s specialty. A great teacher produces great students. 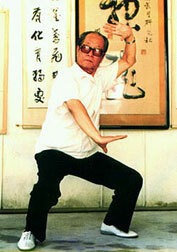 Many of those who studied with Li Shu Wen became important in the history of martial arts. Four of his students from Luo Tong Village were Han Hua Chen, Ma Ying Tu, Ma Fong Tzu and Zhou Shu De. These four introduced a form of BaJi Quan to the Central Martial Academy in Nanjing, a very important organziation at the time dedicated to “modernizing” martial technique and education. This was during the struggling Republican period. Li was a tireless practitioner, always trying to improve his skill; winter and summer he kept practicing. It was said that he never rose at night and went to the bathroom without practicing fifty spear repetitions. Tradition has it that even when he tucked the end of the spear into his clothing and only used the left hand to control the spear, he could still not be beaten.�In one instance, he thrust his spear killing a fly without breaking the window?In another, he used his Big Stick� to drive a nail into a wall, so that even using strength you could not loosen it.�He poured more than 100 jin (110 lbs.) of mung beans in a gunny sack then used a waxwood staff, lifting it up from the ground and tossing it in� the air to flip over three times, before he would return it to the earth. At that time, the Big Spear weapon was one zhang four ch? in length, weighing about sixteen pounds. Liu said that, even though Li’s spear/pole was larger, Li maneuvered it like a small candlestick. In the confrontation, Liu struck straight with the spear. Li used one Pi Da action to shave the attack. When his spear connected, Liu was� spun around 180. Li moved forward and tapped him with the spear three times. Liu tried another attack. He advanced with a suppressing action. Li shrank his body, then abruptly used the Yang rising action,� deflecting Liu’s stick by more than one zhang (ten feet). Liu admitted defeat and honored Li as his teacher. Li initially refused the honor, but eventually allowed Liu to learn from him. The next spring, a martial expert, named Yan, arrived from SiChuan. He had outstanding spear skills, unmatched in his native region. He made a special trip to TianJin to visit Li, wanting to compare skills. Both men went on guard with their spear/poles. Li, using reeling silk energy� (his specialty) made his opponent drop his weapon. But� Yan refused to admit defeat. They engaged in a second bout. Li employed an unexpected move to fling away his opponent’s staff then, advancing,� tapped his rival’s left arm. Yan still would not concede, demanding instead a third bout. Li said: “I give one or two bouts, not three. A third time, I will injure you. Take care for your left eye.” Yan would not listen, advancing fiercely with his weapon. Li used a circling move then struck through an opening in his opponent’s defense.� Holding back, he aimed at Yan’s left eye,� fiercely following with a� tap to Yan’s left eye ball. This stopped the match. Yan, holding a handkerchief to his eye, made the off the cuff remark that Li deserved to be known as a “Spear God.” Nonetheless, he followed the classic formula and said, “In 3 years� I will return to see you.” From this match Li gained a fine reputation and nickname as Spear God. Li actually prepared for Yan’s return by going back to Cang county to strengthen his spear skills. He studied a couple of years like this, and his art raised much higher.� Nonetheless, Yan never returned, always claiming a host of minor obstacles. 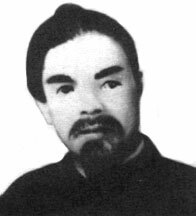 Li Shu Wen was never defeated in his entire life. Only once did he fight to a draw. At the Hebei Wushu Great Hall it was decided that some of the teachers should demonstrate to widen the students and faculty experience. 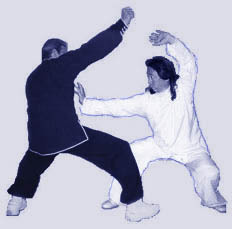 Only two teachers volunteered to “play around a bit.” The light sparring demonstration began between Li as the Baji instructor and Gao HuChen as the Shaolin instructor. Both of these men had mutual respect and their demonstration was eagerly awaited. Gao started with a palm attack to the head. When Li evaded, he ended up meters away. Gao attacked with another high palm strike and Li’s second evasion carried him even further. Then Li returned with a punch to Gao’s abdomen which, when Gao evaded, was followed with a high strike toward Gao. The director asked them to stop and they did, without breathing heavy or showing “the slightest disturbance of their qi.” They broke into mutual laughter. The performance was such a high level that many students and faculty were not sure what they had seen. Comments like “You have very fast hands!” pretty much described the audience reaction. Posted April 16, 2013 by Plum Staff. Comments and trackbacks are open. Follow the comments feed. Tagged with: Adam Hsu, Gong Bao Tian, Jason Tsou, Li Shu Wen, Liu Yun Chiao, Su Yu Chang, Tony Yang, Wu Tan. This is a great article shedding light on a rarely touched style. I enjoyed reading it. Li Shu Wen was a great fighter. It’s just a shame the way he died. He lived such a dangerous life. ← Baji Quan Heritage–New Book!